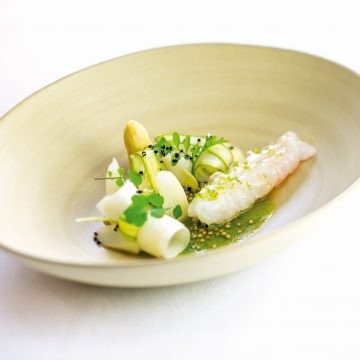 Executive Chef of Michelin-starred Grand Hotel Restaurant Le Ciel in Vienna, Roland Huber uses a maximum of 3 ingredients to create masterful plates that showcase these ingredients to their fullest extent. Free the lobster of shell and intestines. Salt lightly and steam for approx. 4 minutes at 60°C. Top with brown butter and sprinkle with lime zest. Heat lobster fond with mustard seeds. Add watercress oil at the end. Heat the butter over a low heat and allow the butter to infuse with the lemongrass, lemon leaf and verbena. Mix the butter into the egg yolks and add xanthan and salt. Fill into an iSi bottle with two cartridges. Add salt, chicken stock and butter, then cover with aluminium foil and stew for 15-20 min. at 160°C. Cut asparagus into 1mm thin slices and marinate with salt, olive oil and vinegar.